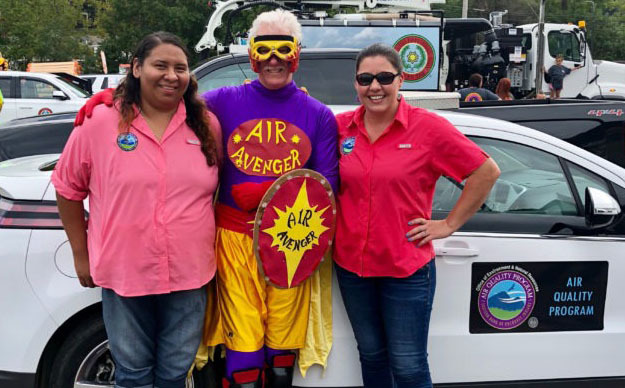 The Air Avenger (aka Bill Eaker, Clean Cities Coordinator for the Asheville, NC region) recently joined forces with the Eastern Band of Cherokee Indians Air Quality Program staff to encourage kids and their parents along the parade route to take action to help “Clear the Air” such as driving low emission vehicles. Cherokee staff drove their agency’s Chevy Volt and the Tribal Chief’s Tesla in the Parade. Eaker says parades are great for reaching an audience that don’t typically attend Ride n’ Drives and similar clean vehicle events.